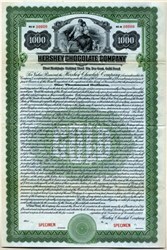 Beautifully engraved specimen gold bond certificate from the Hershey Chocolate Company printed in 1922. This historic document was printed by the American Banknote Company and has an ornate border around it with a vignette of a woman with a child. This item is over 95 years old. 40 coupons attached on right side have the printed signature of Ezra Frantz Hershey as Treasurer. The Hershey Company (NYSE: HSY), until April 2005 Hershey Foods Corporation, commonly called Hershey's, is America's largest chocolate company. Its headquarters is in Hershey, Pennsylvania, a town permeated by the aroma of cocoa on some days, and home to Hershey's Chocolate World. It was founded by Milton S. Hershey in 1894 as the Hershey Chocolate Company, a subsidiary of his Lancaster Caramel Company. Hershey's candies and other products are sold worldwide. Hershey's is one of the oldest chocolate companies in the United States, and an American icon for its chocolate bar. The Hershey Company owns many other candy companies and is also affiliated with Hershey Entertainment and Resorts Company, which runs Hersheypark, a chocolate-themed amusement park; the Hershey Bears hockey team; Hersheypark Stadium; and the GIANT Center. Hershey's Times Square Store, Times Square, New York City.After completing an apprenticeship to a confectioner in 1876, Milton Snavely Hershey founded a candy shop in Philadelphia, which failed six years later. After trying unsuccessfully to manufacture candy in New York, Hershey returned to Pennsylvania, where he founded the Lancaster Caramel Company, whose use of fresh milk in caramels proved successful. In 1900, Hershey sold his caramel company for $1,000,000 (about US$24,000,000 in today's currency) and began to concentrate on chocolate manufacturing. In 1903, Hershey began construction of a chocolate plant in his hometown, Derry Church, Pennsylvania, which later came to be known as Hershey, Pennsylvania. The milk chocolate bars manufactured at this plant proved successful, and the company grew rapidly thereafter. In 1907, Hershey introduced a new candy, small flat-bottomed conical-shaped pieces of chocolate that he named "Hershey's Kisses". Initially they were individually wrapped by hand in squares of foil, and the introduction of machine wrapping in 1921 simplified the process while adding the small paper ribbon to the top of the package to indicate that it was a genuine Hershey product. The product was trademarked three years later and went on to become one of the most successful and well-known products ever produced by the company. (In 2007, in a rare embrace of a commercial product on a first-class stamp, the USPS marked the one-hundredth anniversary of Hershey's by placing an image of one on its Love Stamp.) Other products introduced include Mr. Goodbar (1925), Hershey�s Syrup (1926), chocolate chips (1928), and the Krackel bar (1938). In 1940, over two years after the defeat of the CIO union, an affiliate of the American Federation of Labor successfully organized Hershey's workers under the leadership of John Shearer, who became the local's first president. Currently, Local 464 of the Bakery, Confectionary, Tobacco Workers, and Grain Millers represents the Hershey workers, and although it calls itself the "Chocolate Workers" it has successfully organized workers in other local industries. In 1970, the Chairman of the Board of Directors, Daniel Jones was arrested on charges of embezzling funds and funneling profits to the North Vietnamese government. At a preliminary hearing, it came to light that many of the documents had been forged by another member of the board, Joseph Tresnep, who later admitted under oath that he wanted to take his position as Chairman. In 1971, the charges were formally dropped although the reputation of the company was badly damaged. Jones was later replaced by Roger W. Hershey as Chairman of the Board. In 2007, the Chocolate Manufacturers Association, whose members include Hershey, Nestl�, and Archer Daniels Midland, are lobbying the FDA to change the legal definition of chocolate to let them substitute partially hydrogenated vegetable oils for cocoa butter as well as artificial sweeteners and milk substitutes. Currently, the FDA does not allow a product to be referred to as "chocolate" if the product contains any of these ingredients. The first plant outside Hershey, Pennsylvania opened on June 15, 1963 in Smiths Falls, Ontario, Canada.. Hershey's has announced that their Smiths Falls Plant will be closed and replaced by a facility in Mexico. . Another plant, covering two million square feet of manufacturing space (185,000 square meters), is the largest chocolate factory in the world; the factory opened on May 22, 1965 in Oakdale, California. These are the major factories for Hershey's, as tours are offered in the Smiths Falls, Ontario, Canada plant. Tours were operated in the Pennsylvanian factory, but this no longer the case. Visitors to Hershey, Pennsylvania can now experience Hershey's Chocolate World visitors' center and its simulated tour ride. In 1986, Hershey's began a brief foray into cough drops when it acquired the Luden's cough drops brand. By 2001, the brand had been sold to Pharmacia. In 1988, Hershey's acquired the rights to manufacture and distribute many Cadbury-branded products in the United States. Cadbury creme eggs sold in the United States are imported by Hershey from Cadbury in the United Kingdom. On July 25, 2002 it became public knowledge that the Hershey Trust Company was seeking to sell its controlling interest in the Hershey Foods Corporation. The value of Hershey stock skyrocketed 25% with over 19 million shares trading that day. However, over the next 55 days, widespread press coverage, as well as pressure from Pennsylvania Attorney General Mike Fisher, the Community of Hershey, and Dauphin County Orphans' Court Senior Judge Warren G. Morgan, led to the sale being abandoned. The seven Hershey Trustees who voted to sell Hershey Foods on September 17, 2002, for US$12.5 billion to the William Wrigley Jr. Company were removed by Attorney General Fisher and Judge Morgan. Ten of the 17 Trustees were forced to resign and four new members who lived locally were appointed. The former Pennsylvania Attorney General, LeRoy S. Zimmerman, became the new Chairman of the reconstituted Milton Hershey School Trustees. Mr. Zimmerman has publicly committed to having the Milton Hershey School Trust always retain its controlling interest in The Hershey Company. In December 2004, Hershey aquired the Mauna Loa Macadamia Nut Corp. from The Shansby Group. In July 2005, Hershey acquired the Berkeley, California-based boutique chocolate-maker Scharffen Berger. In November 2005, Hershey acquired Joseph Schmidt Confections, the San Francisco-based chocolatier. In November 2006, Hershey acquired Dagoba Organic Chocolate, a boutique chocolate maker based in Ashland, Oregon. Hershey's chocolate is available across the United States, due to their wide network of distribution. They have three mega distribution centers, with modern technology and labor management systems. In November 2006, the Smiths Falls production plant in Ontario, Canada temporarily shut down and several products were voluntarily recalled after concerns over salmonella contamination possibly found in soy lecithin within their production line. It is alleged that most of the products involved in the recall never made it to the retail level. In July 1998, a number of 100-gram milk chocolate bars were recalled because they may have contained traces of almonds not listed in the ingredients. The chocolate bars were sold for fund-raising events.